The Minnesota Forecaster: Severe Weather Outbreak in the Cards? Things are getting a bit more interesting. The 30% probabilistic outlook for Day 2 has enlarged and shifted slightly east. The entire state of MN is within the 15% area and almost the entire state is 30%, with a large hatched region straddling the MN/Dakota border. Great to see you back. I look forward to your conversation with Novak Weather. It looks like it is heating up a bit is this here to stay or a temporrary blip? This certainly does look like the first legit shot at seeing some wide spread strong to severe stuff over Minnesota and Wisconsin. The heat and humidity should be in abundance from Thurs right through the middle part of next week, so overall instability shouldn't be too much of a problem. There is a decent twist in the low level winds which should help the updrafts to rotate and potentially brew up some supercells. While we have that good twist, the overall wind speeds fairly marginal aloft, so the low level and deep layer shear values aren't overly impressive. If we had a stronger low level jet coming in with a SE surface wind then there would be a pretty big cause for concern. Either way, it should be enough to get some severe stuff going across the area. Another thing is warmer temps aloft which could cap things off if models are underdoing the amount of warm air that will be up there. All of the shorter range meso models do end up firing off storms through the day on Thursday, but the location and timing of where they go is still up in the air. I'm interested to hear Novak's thoughts on this so I look forward to the video. With the amount of humidity coming in, certainly heavy rains will be a concern for potential flooding issues (as MPX had touched on in their discussion). Keep an eye to the sky over the next several days, because we could easily see at least slight risks for severe over the area right into the beginning of next week. Considering Thursday only at this time, after that things will depend on where the boundaries set up. Three of the four ensembles from the HOP WRF plus the latest from the 4km Nam show convection overnight into early tomorrow setting up just north of the metro, that would be due to the nocturnal low level jet bringing the warm front that far north. Once we get into daylight the northward progression of said warm front will probably stall out just north of the metro if not retreat by a county or two. If that scenario should develop it will put the metro in the northern half of the warm sector where convection is more likely between 4pm and 7pm, as a matter of fact the 4km Nam depicts that well. This will be a very fluid situation during the next 5 days. While the biggest threats appear strong winds and very large hail, for Thusday I can't rule out the dreaded T word. Great video(s) guys! 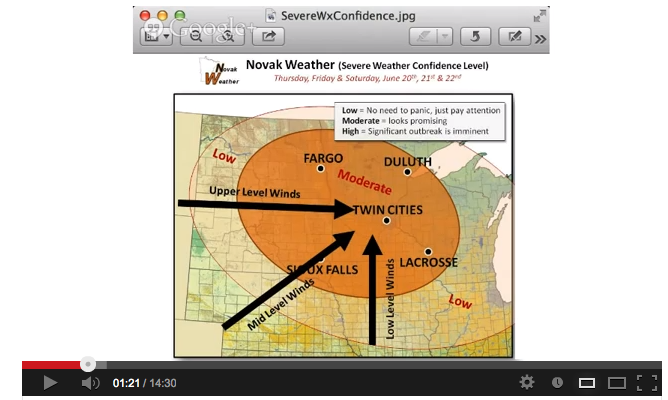 Hoping you are up for a couple more update videos as this active weekend unfolds. Should be fun to watch if everyone is prepared and stays safe! Very good video and explanations. Thanks! good to see this back up again guys! great video as well. WOW...if that panned out, that would be quite the powerful gust front out in front of that thing! I'm putting my roofing guy on speed dial for this weekend! Any snow possible with this system?